(Latest Updated : 16.02.19). 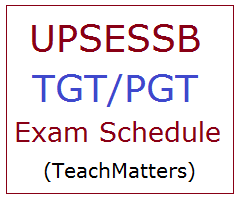 UPSESSB TGT PGT Exam Dates 2019 : Uttar Pradesh Secondary Education Service Selection Board (UPSESSB) has released New Exam Time Table 2019 of TGT/PGT Exam 2016. The written examination will be held in February-March 2019 for the post of TGT (Trained Graduate Teacher) & PGT (Post Graduate Teacher) for TGT Exam 2016 & PGT Exam 2016 against Advt. No. 01/2016 & 02/2016. Admit card and detailed exam time table and dates (subject-wise) will be uploaded by the board at the official website i.e. www.upsessb.org. as per the schedule. See UPSESSB TGT/PGT Exam (2016) Time Table, Admit Card 2019 here. Here is the latest updates on UP SESSB TGT PGT Exam 2016 Time Table and Exam Dates 2019. The written exam will be held in February-March 2019 as per new schedule for the post of PGT and TGT against Advt. No. 1/2016 and 2/2016. Earlier this exam was scheduled to be held in September, 2018 which was later canceled. Here is the latest exam dates. UP TGT Admit Cards 2019 are available now to download w.e.f. 16.02.2019. Note : Detailed Exam Schedule will be uploaded by UPSESSB later.